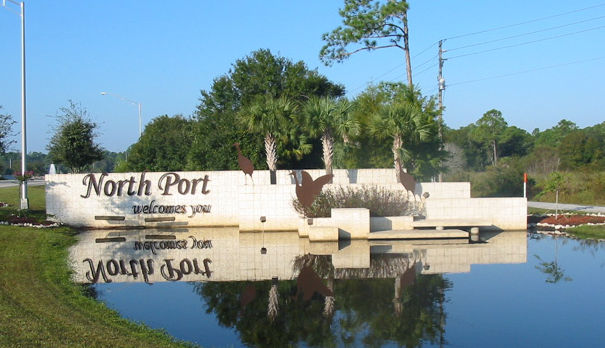 North Port is a city located in Sarasota County, Florida. Visitors like this place because this blessed with many attractions. Let’s find out that attractions. If you are interested to visit this place, Promptbuscharters.com is a best option for hiring charter bus, mini bus, party bus, entertainer coach etc. for a better rent. So call us today at 877-456-9996 and ask for a free charter bus quote. When you think of music, you think of the different types of music. 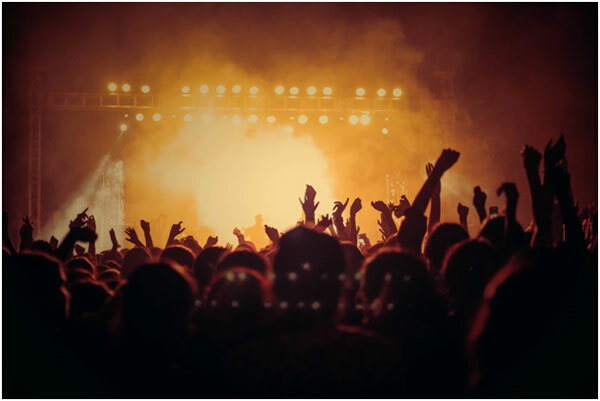 When you think of different styles of music, you may think of a music festival. And when you think of a music festival, you DEFINITELY think of Coachella Music Festival. Come on, who wouldn’t think of Coachella!? The Coachella Valley Music and Arts Festival is notoriously popular with those in love with rock, pop, hip hop, indie, and electronic music. The festival is held every year in April at the Empire Polo Club in Indio, California. Indio lies in the Inland Empire’s Coachella Valley of the Colorado Desert. The first festival was held in 1999, and it has only grown in size and popularity each year. Currently, Coachella entertains over 120,000 people each year. This year, Coachella is from April 12-21 at the Empire Polo Club in Coachella Valley. Hundreds of cars are on the road to Coachella every year, and many attendees decide to stay with others. One of the best ways to visit Coachella is by chartered bus. Below are the reasons why you should charter a bus to get to Coachella. The #1 way we recommend you charter a bus for your trip is comfort. Our buses offer comfort like no other. Our premium leather seats don’t compare to the seats of a normal car. We don’t offer just comfortable seats, but soooo many more features. Our buses feature AC & Heating, Wi-Fi, speaker and PA systems, and much more. Speaking of Wi-Fi and speaker systems, Prompt Bus Charter buses offer entertainment features unexpected of other companies. Most of our bus models feature high-speed Wi-Fi, so you can always stay connected. We also offer charging ports, usb ports, and electric outlets for charging your devices. Also, our speaker systems cover the length of the bus, so the passengers feel immersed in whatever is playing. Another great thing about our buses is the storage capability. Our buses feature plenty of storage space, so you can bring all the stuff you want to Coachella. Some buses feature overhead bins, and others offer rear and under-bus storage compartments. The larger bus models feature both overhead bins and storage compartments below. We know that you want to bring a lot of flashy clothes to Coachella. Our buses offer plenty of space for this. For many, the roads to Coachella Music Festival are unfamiliar and may seem intimidating. That’s where we come in. Our bus drivers are reliable and knowledgeable of every road they drive on. The sheer number of cars on the way there may seem intimidating for some, but our drivers have experienced all types of driving conditions for years. Also, the number of cars may pose a greater cause for accidents. Rest assured, you will be safe in the bus in the event of an accident. Our buses are built with metal plates that can endure most types of stress. Prompt Bus Charters offers you everything in terms of safety, especially on your trip to Coachella. These are just a few simple reasons to take a bus over car to the famous music festival. We know that you want to have a great time at Coachella, and Prompt Bus Charters is here to help you have a fun and safe trip there and back. From amazing comfort to unparallel safety, we and our buses offer it all. We’ve been doing this for thousands over the course of many years, and we would like to add you to those numbers. Happy Travels and have a great time at Coachella! Welcome to Promptbuscharters.com. We have been servicing the city of Brotherly love for many decades, and we are proud to say, we’ve rose to become the #1 company for Charter Bus, Minibus, Party Bus, and School Bus rental services. We are the premiere Bus Charter company servicing Corporate Travel, Weddings, Sightseeing Tours, Shuttle Bus Services, School Field Trips, College Sports Travel and many more! We are the leading provider of Charter Bus services in the Philadelphia area, with most extensive Fleet of any others in the industry. From our 61 Passenger Deluxe motor coach to our 15 Passenger mini bus, you’ll find our vehicles are the most up to date and state of the art in the transportation industry. We are the most trusted charter bus service of corporations from Fortune 500 companies to Mid-Smaller size companies. We have consistently provided reliable, safe, and economic services to our clients. In addition, we guarantee a superior onboard experience that will take your travel to a whole new level. When Business needs to be taken care of, we know time is money, and we promise to get you to your destination on time. We will also make sure you will enjoy first class comfort, with our reclining seats with footrests, a world class entertainment center, On Board Lavatory, and WIFI, we’ll also make sure you stay connected to do the business you need to take care of, while en-route. We know this is the most important day of your life, and we want to make sure your travel is both comfortable and memorable. From our ultra modern Stretch Limousine to our spacious Party Bus, you’ll find the perfect vehicle for your special day. We are sure you’ll have a fun time with your special ones on your special day, in our vehicles. Whether it’s our Fiber optic lighting, and neon lights, or our surround sound and Plasma TV, we’ll create the perfect ambience that you will never forget. We know the last thing you want to worry about while going out to see sights is struggling to find your way around. Let us help you alleviate that headache, we have been taking people on tours in the city for decades now, and we’ll make sure that every minute of your trip is maximized. 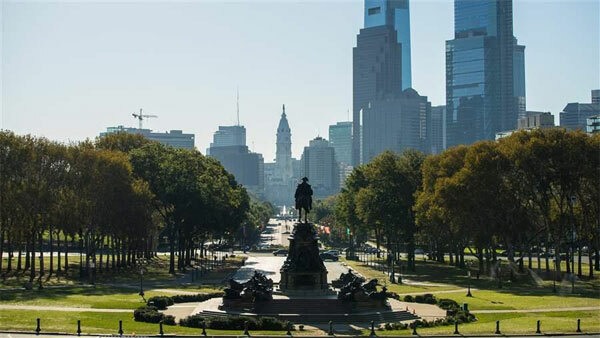 With our most Popular Philadelphia Tour Package, we will explore all the main attractions of the city from the Historic Independence Hall and Liberty Bell Center, to the Foodie Paradise of Reading Market, to the Mutter Museum of Medical history, where Sections of Einstein’s brain has been kept preserved, there’ll be no shortage of fun and excitement. Do you have an upcoming event where you need to shuttle people around, but don’t want to pay individually for separate trips? Then our Shuttle service may be the most economical option for you. Whether you’re trying to transport attendees of your conference/convention/exhibition from the airport, hotel, and Venue; or the guests of your wedding between different destinations, we can work out a plan that’s just right for you. We are the most preferred service in the region. Also, With our industry leading ultra modern fleet, you’ll find our vehicles are the most up to date in the field. We guarantee your guests/attendees will have a first class onboard experience with our popular amenities like: reclining seats with footrests, a world class entertainment center, On Board Lavatory,Power Outlets and WIFI. We also do Shuttle services for College Campuses. When it comes to school trips, be it a field trip, campus tour, Greek event, or any other school event, we are the most frequented charter bus service. Customers prefer us over our competitors, because provide a superior service that’s unmatched in the industry, it is a craft we’ve perfected over decades. So plan your next trip with us! So you’ll get to focus on your event, not frustrating yourself over a less experienced service provider. Once you use our service, we are sure you’ll always come back to us. If you are looking for a charter bus service in Philadelphia, Call us today at 877-456-9996 and ask for a free charter bus quote. Planning a trip to Orlando? Yes, we know! It can be overwhelming. From choosing attractions, hotels, modes of transport, places of dining, the thousands of options can have your mind spinning. But we’ve done the research and have 5 tips that will help you narrow down your choices to your specific criteria. Plan as early as you can: If you want to get the most out of your stay and money in Orlando we recommend you book as early as possible. From booking flights to hotels to theme park tickets, planning and booking early will save you lots of money. The cheapest months are January, September and November (avoid holiday weekends of course, it may cost you more and you’ll have to deal with larger crowds. Decide which attractions you specifically plan to visit: If you know anything about theme parks in Orlando, you know it may take you an hour just to get onto a ride, we’re talking about the best and most popular rides. This is why we recommend you specifically plan out which rides you plan to take, and how much time you plan to spend at each attraction/ride. If you plan and book early, you can get free fastpass+ and reserve your rides, so you could skip the lines altogether. Plan some Downtime: Theme parks can be exhausting, because they’re big! The Disney property alone is about 40 square miles, that’s 14 miles more than the city of Newark put together. So if you want to get the best out of your experience, plan breaks, so you can get some time to refresh and be back at it again to maximize your vacation time. Look for Freebies: From free Fastpass+ to reserve your rides in advance to free shuttles from the Orlando airport to Disney hotels, to Free water, and Medical supplies, there are lots of freebies to be taken advantage of. Make dining reservations in advance: If you’re looking to dine in at popular places, chances are they’re full, so do your due diligence and book then in advance. This is especially important for character dining and special restaurant experiences. We are the local experts and we know how to help you get the most out of your trip to Orlando. So book with us today at Prompt Bus Charters! From Passenger Vans, Limousines, Minibuses, Motorcoaches, Party Buses, School Buses, we have the most up to date fleet in the market. Let us help you take your vacation to the next level. Orlando is known as a haven for foodies the world over, but with increasing competition and fake reviews, finding a decent place to eat can be challenging. You might look at the good reviews of a particular restaurant and go there only to find substandard food and service. So as locals, we thought it our responsibility to tell visitors the truth about the best places to dine in Orlando. Since the Mediterranean diet has been touted as the best diet with people of the region living on the average til 89 years of age,we thought we’d start with a restaurant that serves this type of food. Bosphorus Turkish Cuisine is a Mediterranean establishment with 3 locations throughout Central Florida, and it is a must visit restaurant if you’re ever in the area. 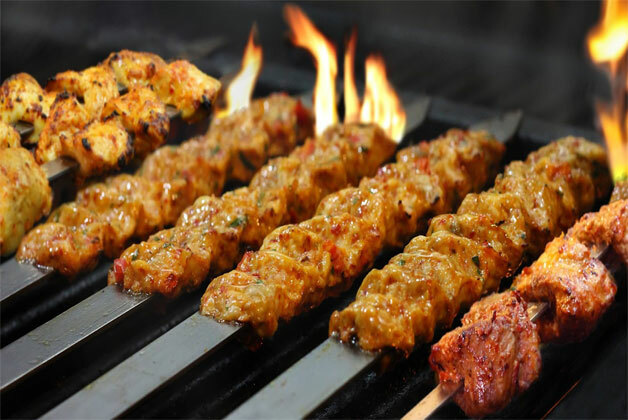 From mouth watering kebabs and seafood, to meticulous salads and scrumptious pastries, you’ll find the food here will delight your taste buds with totally new flavor varieties. While it’s a delicious place to eat, it won’t break the bank either. A party of 2 could have fine dining for under 50 dollars. Our Secret Tips: If your order the mixed grill for 2, you can sample a variety of meats along with rice and salad for just under 40 dollars. It is a massive portion of food for 2 people. During dinner time, this place will be packed, so we recommend you call ahead and reserve. 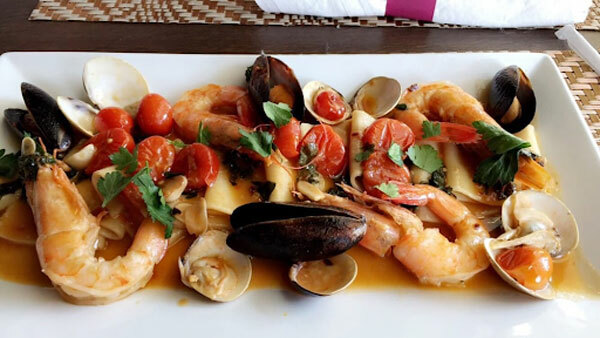 Nestled in the heart of lake nona, this restaurant serves authentic italian fare that’ll have you coming back for more. From flavorful, exotic salads to gourmet pizza, decadent pastas, paninis, and strombolis, the food here will surely bring delight to your taste buds. What’s more? The service here is outstanding, with staff that’ll go out of their way to make your dining experience a pleasurable one. Our Secret Tip: The bread and salad itself can fill you up pretty quickly, so you can go for something light for the main entrees. 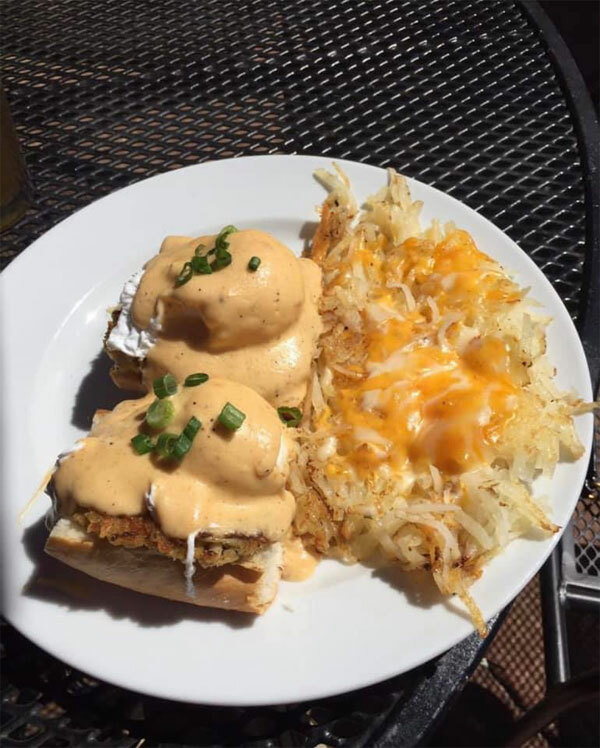 Located in Winter Garden, this restaurant serves up some delectable Cajun fare. You don’t have to go to New Orleans to enjoy great Cajun food, you can find it right here. From mouth watering Gumbo, Jambalaya, Poboys, and Burgers, to their famous cajun boils, this place has a good variety of cajun specialities. Our Secret tip: Order the “Big Papa Boil”, it comes with 2 pounds of crawfish, 1 pound of shrimp, sausages, and corn with great cajun seasoning. Even 2 people will fins this meal hard to finish, but it will keep your bill under 40 dollars. If you are looking for a charter bus for a trip Orlando area, www.promptbuscharters.com, is one of the best charter bus provider in Orlando. Call us at 877-456-9996 and ask for a free charter bus quote. Prompt Bus Charters has been providing Charter Bus and Minibus rental service, for corporate clients for several decades. From Fortune 500 Companies to start ups, we’re the most trusted name for Reliable, Safe, Efficient, and Economic travel. We also have the most modern and well maintained vehicles in the industry, ensuring you a comfortable, enjoyable, and productive trip. We have the most modern fleet in the industry, ensuring your trip is a comfortable, enjoyable, and productive one. Superior Comfort: From our plush reclining seats with footrests to the extra legroom, Heating/AC, Onboard lavatory, you’ll find our vehicles give you first class comfort, that’s unmatched in the industry. Enjoyable Trip: Our vehicles are equipped with state of the art entertainment center, that includes Plasma/LCD TV’s, Surround Sound, Panoramic Windows, and more to ensure you actually enjoy the onboard experience as well. Productive Trip: With amenities such as: WIFI, Power Outlets, State of the art PA System, Projection System, you’ll find our vehicles will help you stay productive to get all your work done even on the go. From our ultra Luxury Deluxe Motor Coaches, Party and Entertainer Buses, to our more budget friendly Minibuses and Passenger vans, we can handle any size group, with any size budget. Even on short notice, we’ll have a vehicle that fits your need ready for your trip. When you book with us, not only do you get great vehicles, you also get a superior service. We’re particularly focus on getting you in and out on time. What’s special about our service is, we choose the most efficient routes for your trip. As a matter of fact your trip routes are always pre-planned, with backup routes identified and established ahead of time to compensate for any incidents that may occur on the road. So you never have to be late to another We value your time, because timing is everything.event again. So call us today at 877-456-9996 or visit promptbuscharters.com and ask for a FREE no obligation quote. 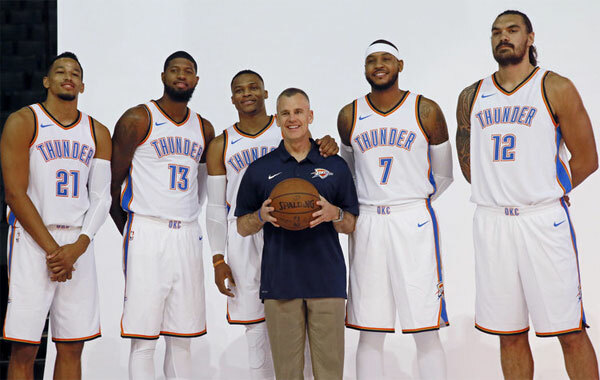 Prompt Bus Charters is the leading Charter Bus Rental Service provider of Sports Teams (Members & Staff), and fans alike. From little leagues to professional teams across the United States, we are the most trusted name for Safe, Efficient, Reliable, and Affordable transport. ‘ have the vehicles you’re looking for. From ultra luxury to economical, from 15 passengers to 56 passengers, we have vehicles that fit your budget, and the the size of your group. When you book with us, you can take advantage of all the storage in our vehicles, whether it’s for your team’s equipment, luggage, or tailgate equipment, snacks, tents, etc., we have the room to accommodate everything your group needs to carry along. We have most up to date vehicles that are efficiently designed to carry all of your group’s goods. From our undercarriage compartments to our overhead bins, there’s no shortage of space in our vehicles. When you book with us, you’re always guaranteed the most modern amenities to make your trip a comfortable and memorable one. We’re not just focused on getting you from point A to B, we want you to have a great onboard experience to make your trip enjoyable. From plush reclining seats with footrests, to panoramic windows, power outlets and WIFI, you’ll have all the amenities for a comfortable, and enjoyable trip all the while staying connected, and getting work done while on the road. Why not watch a few games and movies and listen to music together, and spend time bonding, and getting to know each other? With our state of the art entertainment center with Plasma/LCD and premium sound, you can have a great time together. Not to mention the PA System that will help you get the attention of your group, whether it be for rehearsing your game strategy, playing icebreakers and games,important announcements, it will always keep your team connected and engaged with each other for great bonding time. Having operated for several decades, we pride ourselves on being an efficient transportation company. This means we choose the most efficient routes to get you in and out on time. In addition your routes are pre-planned, with backup routes established and ready to go before the trip. So, you’ll never have to be late to another event, we plan ahead to compensate even for those unexpected road incidents. or visit promptbuscharters.com for a FREE, no obligation quote! Church Trips are an integral part of our business. We have been serving Churches and faith based organizations for several decades, and we’ve become the standard name amongst church groups for all transport needs. For several decades, we’ve worked with thousands of church groups to provide Safe, Efficient, Comfortable, Enjoyable, and Affordable Charter Bus Rental Service. From Conferences, Crusades, and Conventions to Outings, Picnics, Church Competition programs, and more, we’ve managed it all. From our 61 Passenger Deluxe Motor Coach to our 15 passenger Minibus, we have the seating capacity that suits your need. From Ultra luxury to economical, we can work with your budget to find a vehicle that fits your need. Whether you need 5 buses or 500, we have the fleet ready to go for you. While we do have a large selection of buses to choose from, what sets us apart are are well maintained and ultra modern buses. This means your trip will be Comfortable, Convenient, Productive, and Enjoyable. Enjoyable Trip: Our vehicles are equipped with state of the art entertainment center, that includes Plasma/LCD TV’s, Surround Sound, PA System, Panoramic Windows, and more to ensure you actually enjoy the onboard experience as well. Listen to your favorite Christian artists, and sing along. Watch a few movies together, and enjoy great bonding time with each other. Use the PA system to get everybody together to play a few games, and have a great time enjoying each other’s company. Productive Trip: With amenities such as: WIFI, Power Outlets, State of the art PA System, Projection System (great for Bible studies), you’ll find our vehicles will help you stay productive to get all your work done even on the go. We are most adamant about delivering prompt service, as a matter of fact it’s in our name. When you book a trip with us, your routes are pre-planned, with backup routes identified, and established ahead of time to compensate for any incidents that may occur on the road. So you never have to be late again. What’s more? Our drivers are expert navigators, who can get you in and out on time. They know the most efficient, pickup and drop off spots, to make sure getting in and out is a breeze. Our drivers are carefully selected after thorough background checks and subjected to rigorous training before being sent on trips. We only select and train the best. With several decades of operation with zero incidents, you’ll find our drivers are serious when it comes to your safety, and is focused on getting you to places safely and comfortably. Our customer service is also first class, from quote requests to vehicle details, you’ll find our staff are proactive, courteous and efficient. They’ll help you plan your entire trip efficiently using their in-depth expertise. So you’ll always be provided with a custom planned trip suited for your particular need. Our staff will ensure you get only the best experience and service throughout. Promptbuscharters.com is one of the best charter bus service provider in North America. Contact us today at 877-456-9996 for a FREE no obligation, quote. Being the largest Charter Bus Service in North America, we’re the No. 1 Choice wedding transportation. From our sleek 6-8 passenger stretch limousine to our 56 passenger deluxe motor coaches, we have the largest fleet in the industry. That means, we have just the right vehicle for your event. We’re the most experienced provider in the Charter Bus Rental industry with several decades of experience. We also have the Best Safety Record in the industry with Zero Incidents in our decades of operation. 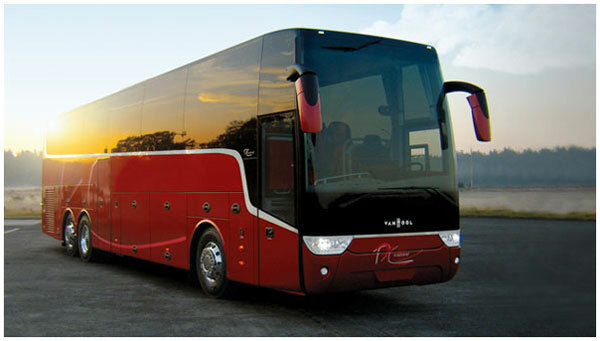 We’re the most reliable Bus rental service, and therefore the most preferred as well. Having done thousands of weddings, we know how to efficiently handle your special day. Your routes are alway pre-planned with them most efficient route chosen for your event, with backup routes planned ahead of time as well, so you’ll never be late for your special day. We’re the largest service, and that means we’re also the most affordable as well. When you book with us, you can choose from Ultra Luxury to budget friendly, so you don’t have to break the bank for your wedding. We have the most up to date vehicles in the industry with first class amenities, and comforts. From Fiber Optic Lighting, Hardwood dance floors, Surround Sound System, Utables/Couches,Kitchenette, Lavatory, to Reclining Seats with Footrests, Panoramic Windows, PA System, Heating/AC, Wheelchair Accessibility and more, you’ll find our vehicles are the best equipped in the industry. 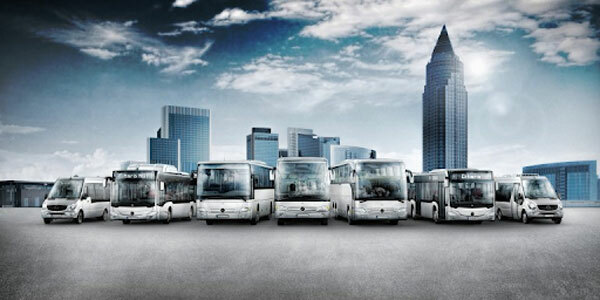 Why use a Charter Bus Rental Service? Why have all your guests separated, and lost scrambling to find the way? Let us help you get your guests together and on time for your big day. The last thing you wanna have happen on your big day is have everyone arrive with wrinkled clothes and a bad attitude. Charter buses offer the extra legroom which will guarantee you and your guests will arrive well rested, without being squished together, and wrinkling clothes. Charter buses offer plush seating with extra legroom, so you can ride comfortably. Charter buses also have room for all your luggage both in the overhead compartment and underneath the bus. When you book a charter bus, you won’t have to worry about designating drivers. From picking you up at the airport, and transporting you between the venue and reception, we can run shuttle services for you. We want you and your guests to get home safely after the wedding, so let us take care of you. We can also do this for your Rehearsals, Bachelor/ette Parties, Showers, and all other wedding related events. 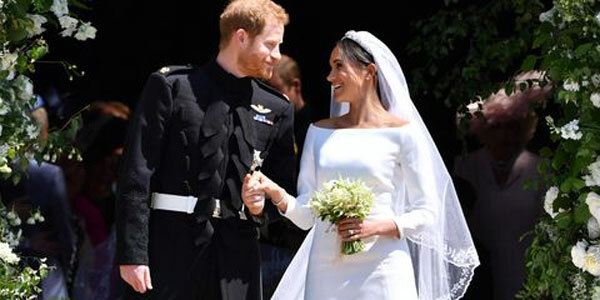 If you are in need of a charter bus service for wedding, promptbuscharters.com is the best choice. Call us today at 877-456-9996 and ask for a free charter bus quote for wedding. While cost may be an important factor in the planning of your trip, be aware, the cost of your trip depends on many different variables. From Distance and duration of your trip to even the time of year you decide to take the trip, they can all affect the final price you may pay for your booking. The Distance and Duration of your trip: If you’re traveling long distance, you will most likely be billed per mile or per day. For shorter trips you’ll be billed per hour. However, be aware, most bus companies require a 5 hour minimum, and you may be billed for 5 hours. The following chart will give you a general idea of some of the costs involved with chartering a bus. The time of Year: There are times of the year, when buses are in plenteous supply, and those times the prices will naturally be cheaper. However, there are periods during the year when people travel more, and the buses are in short supply, and these times you will be paying more. For example, April May and June are expensive months because people use buses more, for : Graduation, School Trips, Proms, etc. However January, February, and July are cheaper months to travel, as people travel less during this time due to the winter weather, and end of summer. Starting City: As bus companies tend to be located outside large cities, choosing a city as the pick up location will cost more, as the buses have to come from outside the city to pick you up. Remember, there are fees that may raise the cost of your trip, that might not be be included in the quote. Fees Such as Tolls, and Parking fees, do increase the cost of your trip, and it’s important, you check with your provider on this ahead of time, so you’re not surprised when you get your final bill. Extra driver, Gratuity, and Hotel: As drivers cannot drive for more than 10 consecutive hours, before taking an 8 hour break, your trip may require an additional driver, if you plan to have your bus go non-stop. 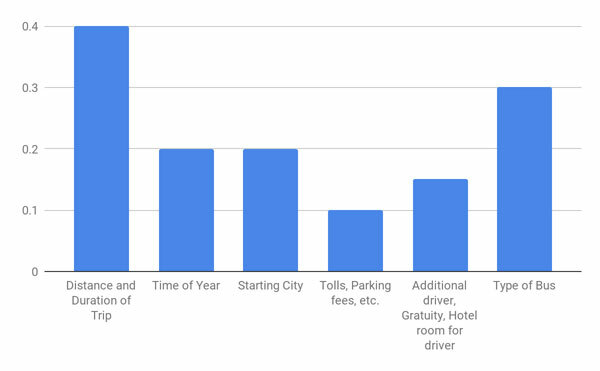 For overnight trips, most transportation companies will as ask you to book a hotel for the driver as well, so make sure to factor this cost into your overall trip cost. Some companies may add the driver’s gratuity on the bill, however some don’t , it’s a good idea to check with the company to make sure you tip your driver for a job well done. We recommend tipping your driver anywhere between 10-20 percent of the cost of the trip. Type of Bus: The type of bus you select certainly affects the cost of your trip. If you have less than 35 people, of course it’s cheaper to book a mini bus, but remember there’s no restroom in the minibus and there’s less luggage space. However if you book a Motor coach, it can seat anywhere from 47-61 passengers, and it is also equipped with a lavatory, and additional luggage space, and of course costs more than the minibus. This option would be more suitable for youi if you’re doing longer trips and have 47-61 passengers. Entertainer, and Party buses are closer in size to the minibuses, but the seats are arranged along the edges of the bus. Additionally, the extra amenities, such as: fiber optic lighting, premium sound systems, flat screen tvs, kitchenette, restroom, dance floor etc., puts them closer in price to a motor coach. Make a detailed itinerary of your trip, including all the stops you expect to take. Book at least 3-6 months in advance to get the best deal, avoid booking in April, May and June. Call hotel or venue and enquire about bus parking, and where it’s cheapest. Also enquire if your driver can get a hotel room free or at a reduced rate when doing a group booking. Get the exact figure on the number of people you expect for the trip to book the right size bus. Try to book the bus in the same location as your pick up location.